It's like I've been heard by the Trader Joe gods, who have chosen to smile upon me. As a voice calling out from the pumpkin-goodie riddled wilderness, I, Russ, the increasingly long-bearded prophet, have stood firm against the gourd-gorging ways of society that befall every autumn. Okay, with that one exception - more gingerly than pumpkinny, but anyways...Moving along...I have cried out for the need of a fall-time product that is delicious and satisfying and has nothing to do with any silly orange thing that grows on a vine. Additionally, I've mentioned my love of honey crisp apples, and have referenced my semi-adhered-to Paleo diet far too often, and have hoped that somehow, some way, Big Joe would hook a brother up. Trader Joe's 100% Honey Crisp Apple Cider. That's right. All juice. No added sugar. No sweeteners. Not from concentrate. Nothing added. Nothing taken away. No nothing except the sweet, sweet nectar of God's most delicious apple. Caveman friendly (though, like most things, not in excess). There's few things more delicious in the world than chomping into a sweet, crunchy, juicy honey crisp apple right off the tree - as a family, we ate half a peck in just over a week and our jonesin' for more. So darn delicious that I salivate just at the thought. And this cider? Listen, it's not the same...but it's close. It's everything except that satisfying bite, without the resulting stickiness in the aforementioned facial hair from excess juice. It's tart yet sweet, and very clean and smooth tasting since it's just one apple variety, not a blend like a lot of other ciders. The cider tastes wonderful both cold right out of the fridge and hot in a mug - it's a delicious, satisfying beverage that paired well from dishes from a lamb stew I made the other night to a simple chicken/sweet potato fry dinner from a Target bag - really, for $2.99, it's real good stuff. I'm not here to say the TJ's can compete with the local, fresh-pressed stuff from an area farm or a place like Cold Hollow up in Vermont, because I don't think it can, but for a cider that's commercially mass-produced, it's pretty darn good. Almost perfect, I'd say. Sandy enjoyed the cider as well, saying after we polished off the last of the bottle that she wished she had the chance to infuse some with a little cinnamon. Well, when we go back to TJ's, I know what we're putting in our cart, so dear, you'll get your chance. Definitely worth a repeat buy all fall long. This looks so incredibly refreshing! I'll have to pick some up next time I go to Trader Joe's. Is it true this cider has no preservatives added? I am specifically looking for a cider with no preservatives and tried this at my local Trader Joe's and it is delicious! 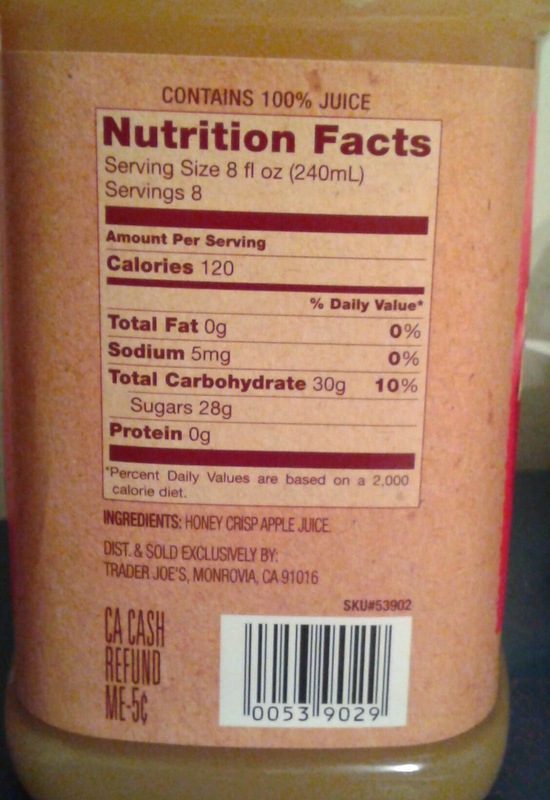 As long as the Trader Joe's label is present, it should be free of preservatives, artificial colors/flavors and HFCS. I saw this product, but was unsure it would taste any different from any other unfiltered apple juice. If you did a blind taste test, would you know which one was the honey crisp? I just tried my Trader Joe Honey Crisp cider. I put a small saucepan of this cider on the stove with Star Anise, Allspice berries and a cinnamon stick to make it more like cider. Then I'll mix with more of the TJ cider and champagne to make a Mimosa! Can't wait until it's done.